Name the BUDDY GUY Painting Contest! After the overwhelming response to the “Name The Gary Moore Painting” Contest, international artist and owner of Creative Bone ArtWorks, Tom Noll, propped up his easel an went to work on his next guitar-player masterpiece. Buddy Guy, Born in 1936 is a Grammy winner and Rock and Roll Hall of Famer. He’s a chief guitar influence to rock titans like Jimi Hendrix, Eric Clapton, Jeff Beck and Stevie Ray Vaughan, and a pioneer of Chicago’s fabled West Side sound, a living link to that city’s halcyon days of electric blues. Buddy left Louisiana in 1957 for a life in Chicago, and as a young guitar player, grew up under the tutelage of Blues greats Muddy Waters, Willie Dixon, Howlin’ Wolf, Little Walter, Sonny Boy Williamson…etc, etc. Today in Chicago, he owns “Buddy Guy’s Legends” who’s stage has been graced by some of the world’s most talented musicians and has built a reputation as the nation’s premier blues club. Just a few examples of the talent that has graced the stage are Willie Dixon, Albert Collins, Bo Diddley, Van Morrison, The Rolling Stones, The Black Crowes, David Bowie, ZZ Top, Junior Wells, Slash, John Mayer, Stevie Ray Vaughan, Greg Allman, Clapton, Otis Rush, Pete Townsend, The Pointer Sisters, and quite often…Buddy himself. Guy, a living legend has firmly cemented a blues legacy that places him squarely in the company of his heroes who came before. This is a “sketch” that Tom made from a photograph taken by “Dr. Jazz”, Ueli Frey, who captured Buddy Guy on film at the 2008 Montreux Jazz Festival. Ueli lives in Switzerland and has worked as a press photographer since the 1970’s. Along the way he’s had the opportunity to attend hundreds of concerts. He now uses his website to make many of the photographs accessible for the many fans to enjoy. You should definitely check it out! Tom estimates that the Buddy Guy painting will take another few weeks to come together (progress shots will be posted), with prints of the original oil painting then available to the public in late January. Take a look at the “Creative Bone ArtWorks” Official Web Site and browse Tom’s extensive gallery of “Art That Rocks” which includes many guitar players like Eric Clapton, Carlos Santana, Jeff Beck, Muddy Waters, Keith Richards, David Gilmour, B.B. King, Bruce Springsteen, Dave Matthews, Jimi Hendrix, Stevie Ray Vaughan, Les Paul, Johnny Cash, and of course…Gary Moore. There you will find information about pricing, sizes and other info on Tom’s creative artwork. 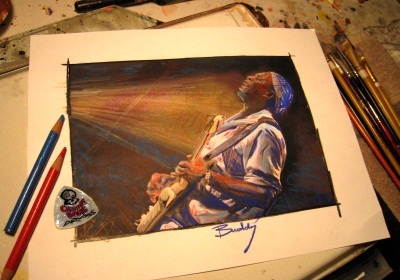 GuitarDaddy Tip: You can Pre-Order a Buddy Guy print by contacting Tom directly. Pre-ordering will allow you to reserve a low-numbered print and to receive your print much faster. In addition, for GuitarBuzz readers, Tom is offering a “BONUS Hand-Signed Inkjet Print” of the original sketch of the painting, along with the final print, to the first 10 pre-orders! ALL YOU HAVE TO DO TO ENTER THIS CONTEST IS LEAVE A COMMENT TO THIS POST WITH YOUR SUGGESTION FOR A NAME OF THE BUDDY GUY PAINTING! Oh Yeah!! I just wanted to say how excited I am to once again be in touch with the fans…the people that I’m touching with my artwork. 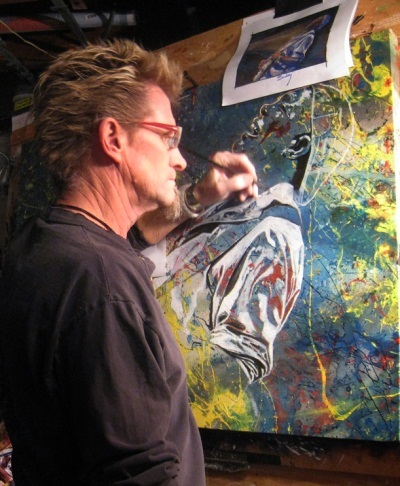 Its inspiring to hear from you while involved with the process of creating the painting. I look forward to all your names and comments! I hale from the same place as Buddy so, I know other name(s). Believe me, he’s one of the best talents to ever come out of the West Side. in Anaheim this January? If you are ,will you exhibit your work? I think Polka Dot Blues would be a good title as he is famous for his polka dot Strat. To a truely remarkable blues legend that is Buddy Guy. He is sure a great blues pioneer and when I listen to him play I always say to myself he is “Buddy Marvellous” and that expresses to me the awesome talent and feeling the man has. You don’t love me, you love my polka dots ! Doing the Polka without any dots !! A few more…this is fun! Buddy Guy – Dam’n right I got the blues ! Wow! Tom you continue to amaze me. You just get better & better. Buddy Guy is looking really GOOD! 3) Survivng the Breeze with Eaze! Thanks Breeze! Just caught your radio show! Thanks for the promo!! Let’s see all your listeners try and “outname” you! Damn right he’s got the blues! By the light of the blues. Okay, Tom….these are my shots at the deal. Happy New Years Tom !! some more awesome work !! How about a portrait of Laura Nyro ??? Hey Tom, I posted this contest on the FB page of our local Blues Radio station, DAWG-FM, hoping to show even more Blues fans your brilliant talent, and give as many true Blues fans a chance to win this wonderful prize. Thank you for this! Thanks everybody…this is inspiring me greatly as I’m working on this painting…thinking of you all!! Thanks Greg…I’ll watch for word from your fans! Tom, your work is AMAZING! I’ll call it “When My Left Eye Jumps” after Mr. Guy’s tune! – Yet another AWESOME painting Tom. Buddy Guy was one of the first “real” shows my old man took me too and i’ll never forget the magic…..here’s my attempts. become part of the song !!! Wow…what a collection of great names. I wonder what the chances are of Buddy viewing these? I’ll be making my pick and announcing it soon! I hope you’ve got some room on a wall for the print!! This painting is a picture of a Buddy Guy song. Called……Down to my soul. Buddy Feels The Blues Shinning On Through His Heart And Soul from a Legend Mr. Buddy Guy. Buddy can transfer the joy and pain of the blues with his guitar and face, while showing a sense of humor. I love the man and his music. As the …naming… of my painting becomes a reality today, my fine tuning of details continues for another day before the finality of capturing it for the print process. I want to thank you again for your creative suggestions along the way, and your support with the advance print orders, which reconfirms your belief in me. I’m truly honored to create this art piece for you, and am grateful for this GuitarBuzz forum to be able to share the process. It has been a great inspiration and I can’t wait for you to recieve your personal prints! !